After a while I just got fed up with music about heartbreak and I wanted something that is so powerful that it was actually going to break my heart. I wanted an album with a story so depressing and detailed that every song is almost like a depressing chapter of a best selling book, I wanted an album with lyrics so well-written, depressing, and catchy that they define every facet of heartbreak while sticking to the authors story, I wanted music that actually matches the mood of the story, and I wanted an album where every song is a special experience that made me cry, smile, and think the darkest of thoughts out loud. After almost a year of searching for this album, I gave up on my dream of listening to an album so powerful that it gave me nightmares. 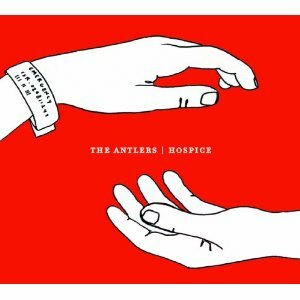 Then one day I decided to listen to The Antlers Hospice. Hospice is an album that is so powerful that it can actually break your heart. The first reason Hospice is a heartbreaking album is that the album has a great concept and story behind it. A lot of people believe that Hospice is a concept album about a doctor falling in love with a terminally ill patient, some people believe that Hospice is just about a man watching his lover die and not being able to do anything about it, and some other people believe that Hospice was just about a really awful dream. It is possible that all three of these explanations are correct just as it is possible that none of these explanations are correct. I am of the opinion that the exact story behind Hospice doesn't really matter. What matters is that the album has songs that aren't just about breakups, songs that aren't just about depression, and songs that are just about war. The concept of this album takes the listener to dark places that he/she has not been before. It is the story of a man who is losing the thing that matters the most to him and cannot do anything about it, it is the story of a man having to live with the regret of watching the love of his life die, it is the story of a man feeling helpless in what is supposed to be the most helpful place in the world, and it is the story of a man who is losing everything at the sight of a lost heartbeat. While other albums might be about things that are a tad depressing, Hospice revolves around a concept that must people cringe and weep at the thought of. Hospice is a short novel with an inevitable ending, it is a ten song cry for help that only we can hear, and it is something that is so heartbreaking that it is beautiful. Hospice may have a morbid and depressing concept but it is an album for anyone who is heartbroken: each song can be an anthem for a person who just lost a loved one, someone who wants to fall in love, someone who is at war with their emotions, and someone who just wants to sleep. The brilliance of Hospice is that it is based on a concept that is so morbid and suffocating that it ends up being the perfect album for anyone who is struggling with something that is beyond their control. Just about anyone can have a good idea. What makes the person with a good idea a good writer is being able to put the brilliance of that idea in words. If Hospice just had depressing lyric after depressing lyric then it would just be a dreary ten song experience. One of the reasons that Hospice is such a heartbreaking story is that its narration (its lyrics) are depressing and filled with symbolism. Just about every song on Hospice has a set of brilliant lyrics: on "Kettering" Silbermann mumbles that "I should of quit but instead I took care of you,"on "Sylvia" he screams "Sylvia get your head out of the oven!" on "Atrophy" he whispers "in your dreams I'm a criminal, horrible, sleeping around/while you're awake I'm impossible, constantly letting you down," on "Bear" he sings "we're terrified of one another/and terrified of what that means," on Two he yells that "no one is gonna fix this for us no one can/no one's gonna listen no one understands," on "Shiva" he tells us how "all the machines stopped at once," on "Wake" he screams "don't ever let anyone tell you you deserve that," and on "Epilogue" he sadly sings "but now its not the cancer ward, we're sleeping in the morgue." Considering the concept of Hospice, it may be one of the great lyrical achievements of our time. Silberman's lyrics are sad but never forced, witty but never joking, quoteable yet original, and consistently brilliant in just about every song. The lyrics on Hospice are one of the main things that enables the album to be such a heartbreaking masterpiece. The music on the album also perfectly matches the concept and the lyrics. The soft and open feel of "Kettering" make you feel like you are about to listen to a very tragic story, the distorted rock feel of "Sylvia" makes you feel like you are listening to someone lose themselves in their situation, the dark piano and distorted vocals of "Atrophy" makes you feel like Silbermann's character is in a "lose-lose" situation, the childish piano and upbeat chorus combines the innocence of new life (childhood) and the darkness of watching someone who is about to lose their life (the patient,) the abrupt whirling sound of "Thirteen" makes it sound like a quick prayer or even a desperate cry for help, the fast acoustics of "Two" make it sound like a premature Eulogy, the looping piano and slow drums of "Shiva" make you feel like the character just wants "it to be over," the piano and ghost like choir on "Wake" make it sound like Silbermann's character is finally ready to open up about all of his misery, and the acoustic harmonies of "Epilogue" make it sound like this whole thing was just a nightmare. How the sound of every song matches the complex story and the loaded lyrics so easily is almost beyond comprehension. But Hospice itself is an album that has always been beyond my comprehension. It is an album to cry to yet marvel at, it is an album that is heartbreaking yet brilliant, it is an album that has ten great songs that essentially revolve around one struggle, it is an album that is really more of a best selling novel, it is a love story that is really more of a bad dream, and it is one of the only things in a world suffering and strife that can make me weep. Usually we define heartbreak as a lost love, a lost self, a lost feeling, or a lost war. These themes are so played out though that we shrug at their very scent. With Hospice The Antlers prove that you need only one thing to make a heartbreaking album: originality. Great review - best one I have read and I have read quite a few. Hospice still haunts me.